The Global Volcanism Program has no activity reports for Waw an Namous. The Global Volcanism Program has no Weekly Reports available for Waw an Namous. The Global Volcanism Program has no Bulletin Reports available for Waw an Namous. The isolated Waw an Namous (also spelled Wau-en-Namus or Uaw en Namus) lies in the Sahara desert of south-central Libya, south of the Haruj volcanic field. 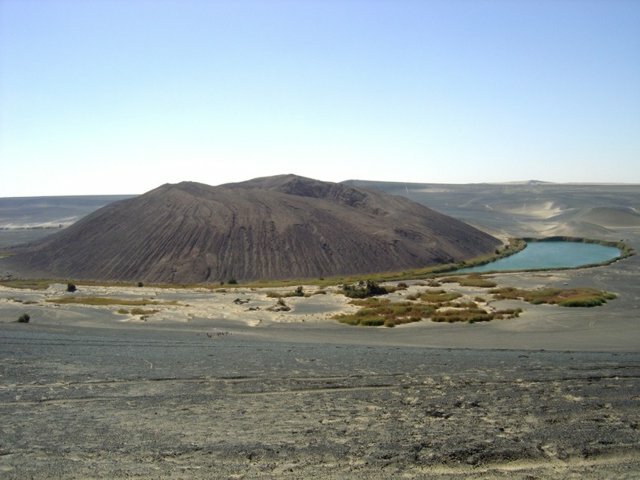 A 4-km-wide, 100-m-deep caldera contains the Waw an Namous post-caldera scoria cone. An apron of dark basaltic tephra extends 10-20 km around the caldera in stark contrast to the light-colored desert sand prominent in satellite views. Three small salt lakes of variable color contribute to the name of the volcano, which means "Oasis of Mosquitoes." The youthful appearance of the central cone has suggested it may be as young as a few thousand years, although the arid climate may mask its actual age. Yellow sulfur deposits are found in the 150-m-wide crater. Other basaltic lava flows occur several tens of kilometers NW of the volcano. Bardintzeff J-M, Barois P, 2006. (pers. comm.). Pesce A, 1966. Uau en Namus. South-central Libya and northern Chad, Petrol Explor Soc Libya, Annu Field Conf, 8th, p 47-51. The Global Volcanism Program is not aware of any Holocene eruptions from Waw an Namous. If this volcano has had large eruptions (VEI >= 4) prior to 10,000 years ago, information might be found on the Waw an Namous page in the LaMEVE (Large Magnitude Explosive Volcanic Eruptions) database, a part of the Volcano Global Risk Identification and Analysis Project (VOGRIPA). There is no Deformation History data available for Waw an Namous. There is no Emissions History data available for Waw an Namous. The Global Volcanism Program has no photographs available for Waw an Namous. There are no samples for Waw an Namous in the Smithsonian's NMNH Department of Mineral Sciences Rock and Ore collection. IRIS seismic stations/networks Incorporated Research Institutions for Seismology (IRIS) Data Services map showing the location of seismic stations from all available networks (permanent or temporary) within a radius of 0.18° (about 20 km at mid-latitudes) from the given location of Waw an Namous. Users can customize a variety of filters and options in the left panel. Note that if there are no stations are known the map will default to show the entire world with a "No data matched request" error notice. Large Eruptions of Waw an Namous Information about large Quaternary eruptions (VEI >= 4) is cataloged in the Large Magnitude Explosive Volcanic Eruptions (LaMEVE) database of the Volcano Global Risk Identification and Analysis Project (VOGRIPA).